Our Arizona bed and breakfast’s modern territorial hacienda is designed to evoke the traditional architecture of Spain and Mexico. Mexican hardwood furnishings with hand carved embellishments add an elegant touch to the setting. 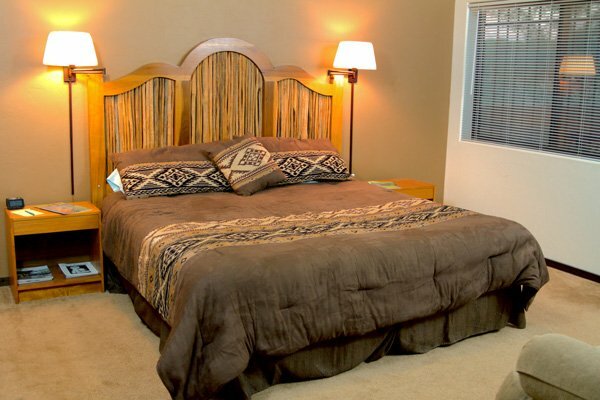 We have 10 comfortable guest rooms, each with a private bathroom with shower. 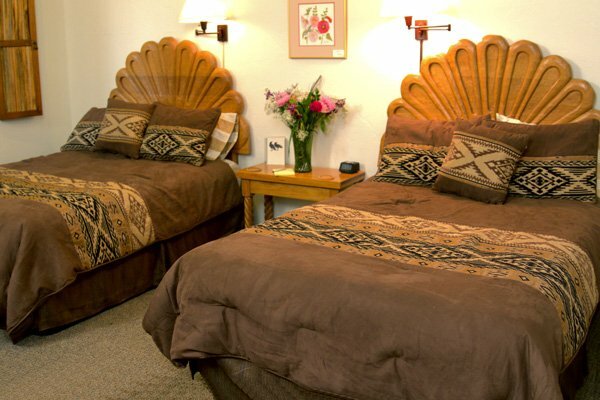 Each room features elegant linens in tasteful and relaxing colors that match our southwest setting and themes. A table and chairs are just outside your window on the courtyard walkway. Our Arizona bed and breakfast also features the art from local artists hanging in each room. We also have one King Suite that features a full kitchen, dining area, living room with fold out couches, and a separate master bed room with a King Bed, plus an en suite bathroom with shower. We actually listen to our guests, and have added almost every convenience amenity possible to our rooms for your comfort. Good bright (3 way) over bed lights for reading. A smart alarm clock that wakes you gently to classical music - it also has 2 USB charging ports on the front. And the alarm is easy to set (instructions are provided!). The display easily adjusts for bright, medium, and low to very dim so the display is easy to read at the light level you prefer. A Table and two comfortable chairs, with good reading light overhead. Convenient electric outlets if you need to charge your laptop, phones, etc. We also have extra charger blocks if you need them and a variety of cables in case you forgot to bring yours. All the bathrooms have hand painted Mexican tiles in the shower and on the counter tops. All our toilets are low flow (water conserving). In the bathroom we have extra paper products (TP, Kleenex), Cotton Balls, and Q-tips. Extra Towels. and Liquid soap on the counter and liquid shampoo, conditioner, and shower gel in a dispenser in the shower. There are two water glasses on the bathroom counter. While our shower heads are low flow you will like the design of the shower heads and will not even notice that they are efficient. Guests often ask how they can buy these great shower heads. We use energy saving flash water heaters. There are 4 of them around the inn. It might take just a few seconds longer in some rooms for the hot water to get to your room, but once it is flowing you have an unlimited supply. There is also a fire extinguisher under the bathroom sink - we hope you never have to use it! Of course the rooms have smoke detectors. Every room has an in room safe for you to use - just select your own lock/unlock code or swipe your credit card to activate the lock. We strive to be energy efficient (all of our electric power comes from our solar panels). We use propane flash heaters for hot water so we don't have to keep large tanks heated 24x7. All the locks throughout the inn, on guest rooms, and on the back gate, are digital locks. You will be provided with cards for your room that have your room combination and the back gate combination on them. We provide WiFi everywhere around the inn for your convenience. Plus there is a public PC with a printer if you need to print boarding passes. There is coffee, tea available throughout the day. And we make daily pies and other confections for your enjoyment. Add in the many bird feeders around the property with great seating areas. Our Goal is to make sure you are comfortable and have everything you need to make your stay perfect!